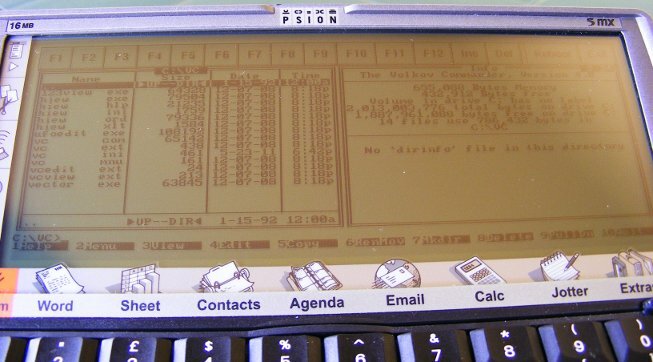 Psion Series 5/5mx is powered by a 32-bit ARM710T processor. That's enough to emulate an 8086 (actually 80186) PC/XT. 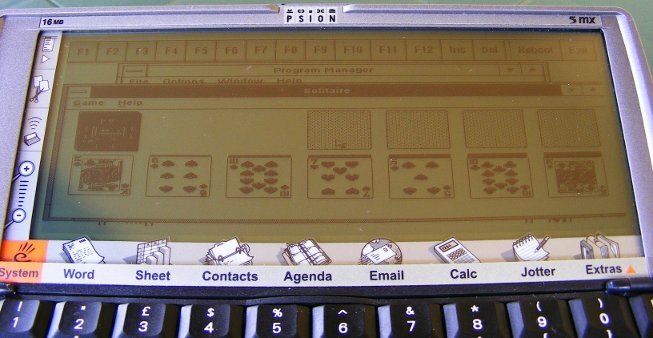 According to the producer's website Psion 5 runs Eratosthenes Sieve benchmark with 0.64 and integer calculations with 1.28 XT's speed (Psion 5mx reaches 1.43 and 2.72, respectively). That's fairly nice. Download FreeCOM. It's the only DOS I found to be working. Under MS Windows you may do it with WinImage. Copy FreeCOM files to your "disk". Copy EPOCFS.SYS, EREDIR.EXE and XTMMOUSE.EXE from the XTM package. Rename the image to DRIVEA.DSK and copy it to your Psion. When you have XTM running, it's time to install some goodies 🙂 I managed to launch such essentials as Volkov Commander 4.0, Turbo C 2.01, Turbo Pascal 5.5 and Gnuplot 3.4 (you need to set terminal to mcga). Games, even those from XT era, don't work or run with an unplayable speed. Text games, however, do quite nice - e.g. Castle Adventure, one of the first PC games I played back then. You can download XTM from here. could you share your windows 3.0 install? I’m very interested!